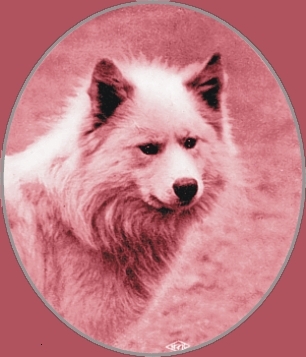 UNTIL quite recent times little was known of the Samoyeds or of their dogs, and now that a little more is known, the conclusion which forces itself upon him who reads of the people and sees the dogs, either in the flesh or in these striking pictures, is that the dogs are the better worth knowing of the two. Mr. Trevor Battye, indeed, once conceived the idea of bringing over a Samoyed group, chooms and all—chooms are the portable dwellings in which they live—to England as a raree show, but the idea was not carried out by him and if anybody else carried it out, if, for example, Samoyeds were once a side show of the defunct Aquarium, then I ,am glad to have missed them. It cannot, indeed, be said of the Samoyeds, as it was of the American Indians, that manners they have none and their customs are beastly; for they can be a kindly little people. But they are very dirty and populous, and the bleak Tundra is the best place for them. “ An absolutely treeless waste, lichened, swampy, intersected by streams --this is the true Tundra. ” It runs in a belt, 500 miles at its widest point, for 4,000 miles along the shores of the Arctic Ocean, and the Samoyeds, a nomadic reindeer-driving race, inhabit its western tracts. East of them come the Ostraks, of whom one seems to have heard, and the Chukchis, and perhaps these have dogs also. It is partly to fearless explorers, such as Nansen and the leaders of the Jackson-Harmsworth Expedition of 1893-94, and partly to ornithologists of the type of the late Mr. Seebohm, who was a prince of his kind, and of Mr. Trevor Battye, that we owe our knowledge of the people and of the land. It is to the former type that we owe the introduction of the Samoyed breed irito England. In this little passage one sees the raison d'etre of the Samoyed dog. He is not, as anybody might think, from his sturdy frame, at first sight, an essentially sleigh-drawing dog, although he may be used as a beast of burden on occasion, but he is to the Samoyed as the collie is to the shepherd on the hills. In other words, he is the Samoyed's right hand. Hence comes it that, as in the North Country, in Scotland, or in Wales, you may buy a sheepdog pup of fair appearance for a-few shillings, but you will often fail to acquire an ugly but well-trained dog even at a high price, so the Samoyed, who does not care two straws about looks or pedigree, will not- part from a tyke that knows his business. Moreover, that business is a fairly tough one. The Samoyed is an Arctic nomad, wandering about with his herds of reindeer, which he leaves perforce to forage for themselves. It is when he wants to move on that the pack of dogs goes circling round the herd of reindeer, numbering perhaps seven or eight hundred, while their master (very clumsily, Mr. Jackson tells us), lassoes away until he has secured a team. That is the main value of the Samoyed dogs, although explorers have made great use of them as sleigh dogs pure and simple in the. first place, and, in the end, as food. In some cases, too, wanderers in the snow and ice seem to have found them useful in retrieving wildfowl. Even so have I seen a Chow, not less wolf-like than the Samoyed, stand by his master's heel at the covert-side; and" after a while that Chow (it belonged, by the way, to Lord Dunraven) began to perceive what was going on. So, having seen guns rise and pheasants fall, and beaters collecting the pheasants and placing them in little heaps before the game-cart came, it also amassed its little heap. In fact, there is nothing, save only speech, that a clever dog of any breed will not learn. Whether the breed will ever be put to any practical use in Great Britain is an open question, but that will not in the least militate, and has not militated, against its adoption as a breed to be kept. It has, to start with, the patronage of Queen Alexandra, whose Jacko is well known to fame; and the Queen is distinctly a judicious fancier of dogs, who provides for them well in kennel without coddling, and, pays to them a sufficient amount of personal attention. Moreover/the pictures show that the Samoyed is alike fascinating in puppyhood and a noble dog when adult. They are taken, by kind permission, from the kennels of Mrs. Kilburn Scott, of Beesfield, Farningham, Kent. To go through them seriatim, surely nothing could be more fascinating than the group of puppies, pocket editions of Polar bears, shown in one of the pictures. 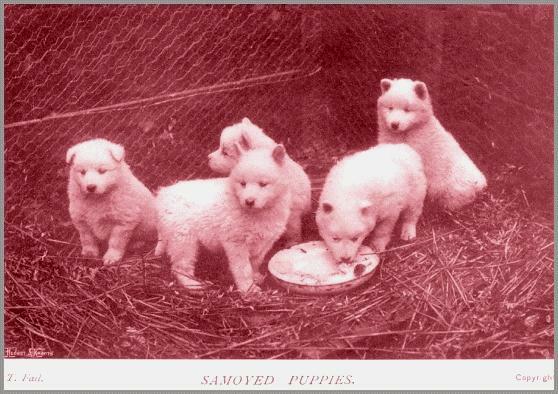 Their pedigree— they are by Queen Alexandra's Jacko—shows that the Samoyed: breed is beginning to be 'treated with a care to which it was certainly a stranger on the Tundra. 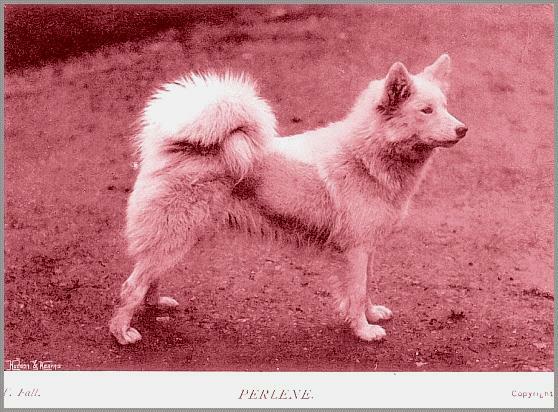 Perlene is a real beauty, white as the driven snow of the Arctic circle, descended from dogs used on the Jackson-Harmsworth Expedition, and a prize-winner. In passing, it may be wondered how that versatile man, the all-round judge, arrives at his conception of what the points of a Samoyed dog ought to be. Of Nansen there is an eminently suggestive portrait. The grave dog looks as his namesake did when he returned from his first great expedition—as if he were looking back from the comforts of England to the grim terrors ot the frozen North. 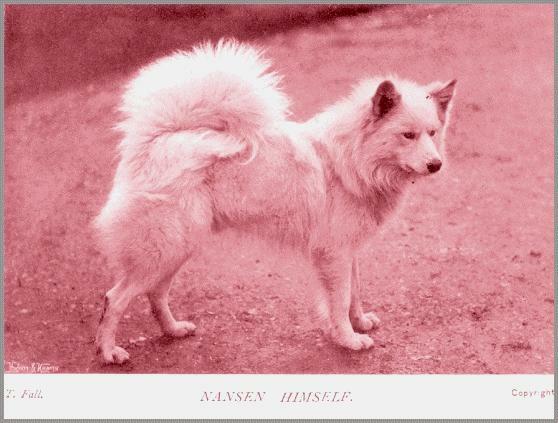 Nansen, by Lady Sitwell's Musti, one of; the finest pure white Samoyeds ever imported into the country/has done well on the show-bench. 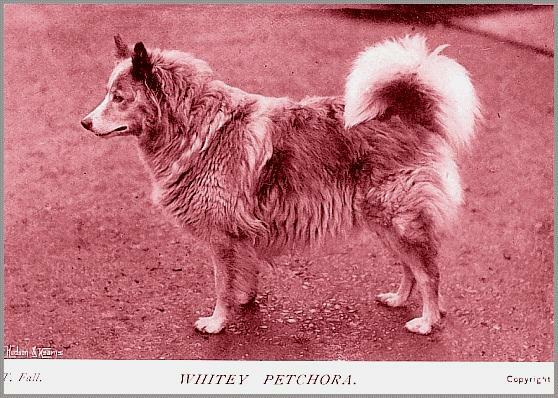 Whitey Petchora, an imported dog with unusually expressive eyes, may, perhaps, be accepted as a typical specimen of the breed. The face is as intelligent as that of a collie of the hills, far more so than that of many a show collie. The wide skull, alert/ears, deep coat, straight fore-legs, and powerful hind-quarters, combine to leave the impression of a thoroughly warrantable dog. 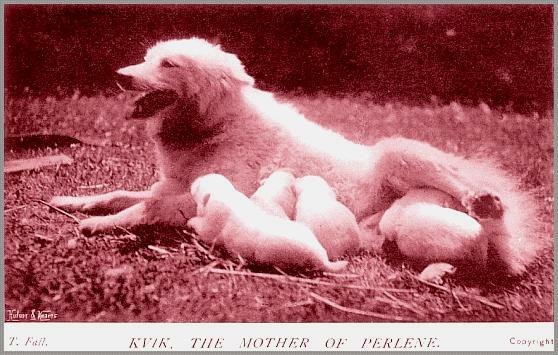 Kvik, the mother of Perlene, is shown with a litter of which, for all I know to the contrary, Perlene may be one. She was imported by Dr. Koettlitz, a member of the Jackson-Harmsworth Expedition, now with the Discovery in the Antarctic. Musti is again a very fine Samoyed. It may be added that Her Majesty Queen Alexandra has been graciously pleased to accept a Samoyed puppy from Mrs. Kilburn-Scott. Of the character of these dogs I cannot speak from experience, but having regard to their general look of intelligence, I venture to say that under a judicious master, or, still better, under a good mistress, any and every breed of dogs is companionable and safe.